You’re in for a treat with these Crispy Fried Onions! 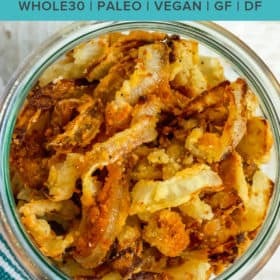 They’re so good that it’s hard to believe these healthy onion straws are Whole30 compliant, keto-friendly, and vegan. 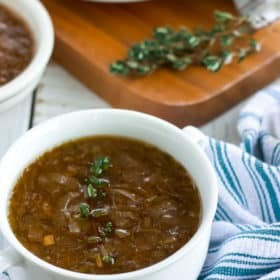 Shoestring onions are a perfect topping for soups, casseroles, burgers, steak, or a salad. 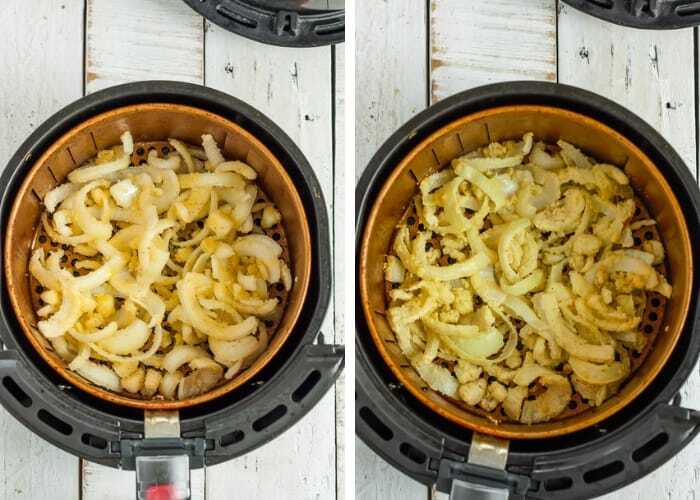 These fried onion strings can be made in the air fryer or baked in the oven. 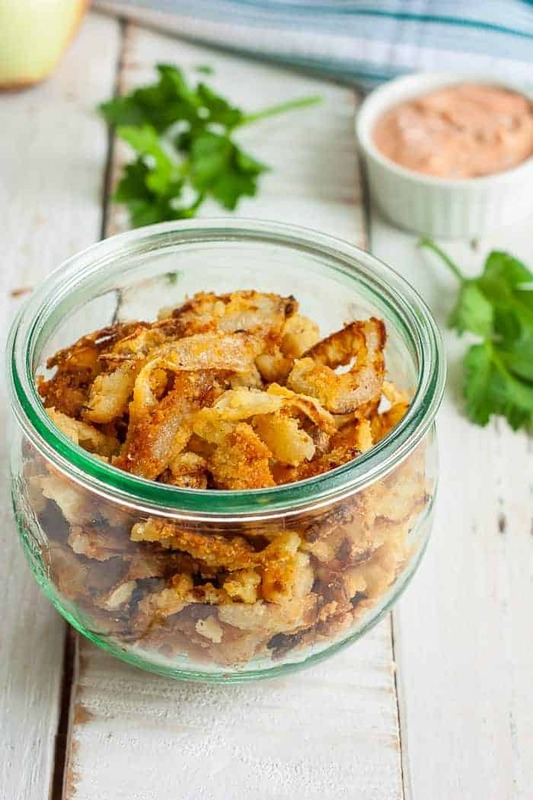 Take any meal to the next level with these crunchy gluten-free fried onions! There are two things in this world that can be paired with almost anything and they instantly make the dish better. One: Homemade Taco Salad Bowls. 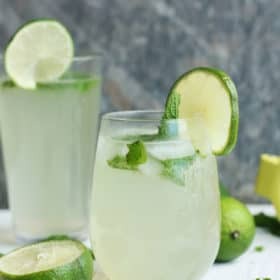 And the second? These crispy fried onions. 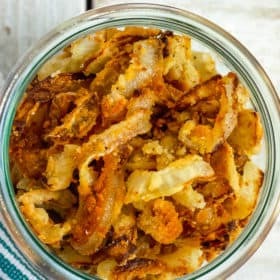 Crispy fried onions, which might also be called onion straws or crispy onion strings are hopelessly delicious. Most people put them on top of green bean casserole (my Thanksgiving nemesis), but why stop there? 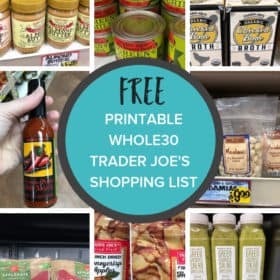 Try them on top of Whole30 Potato Soup, Healthy Cauliflower Soup, or as the perfect crunchy topping on Pressure Cooker Chicken Tacos. 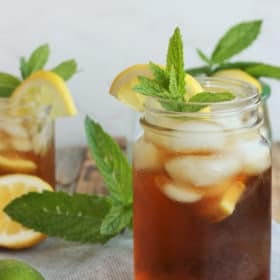 Even though the directions for this recipe uses an air fryer, I have included conventional baking instructions too. 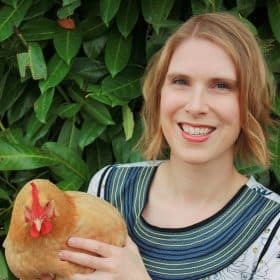 That’s right – no frying! 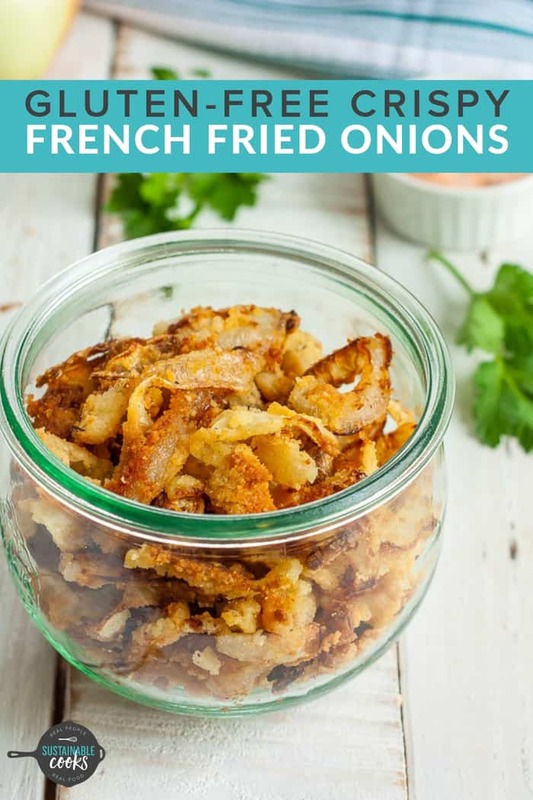 Thanks to some ninja-like tricks, you can make these gluten free french fried onions perfectly crispy without deep frying them. 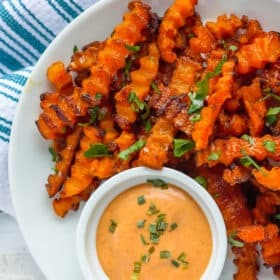 And if you’re smart (and I know you are), you’ll find a way to pair your fried onion straws with Sweet Potato Fries Dipping Sauce. Make it happen. What Ingredients Do You Need to Make Crispy Fried Onions? 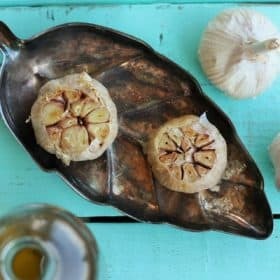 What Kind of Onions Work Best for Shoestring Onions? If you want a strong onion flavor, use white or yellow onions. Sweet onions (like Walla Walla or Vidalia) work great if you don’t want the onion flavor to be overwhelming. Slice your onions and place in a bowl. 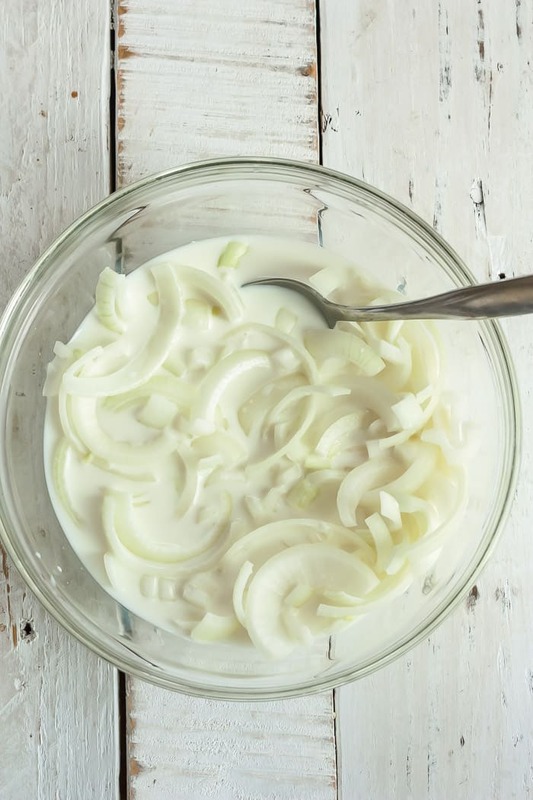 Pour milk over the onions and using a spoon, smoosh down the onions so they’re mostly covered by the milk. Smoooooosh. Let sit for 10-15 minutes. 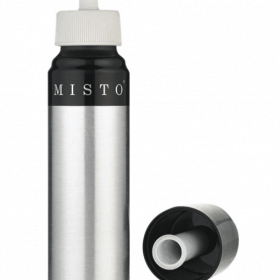 Meanwhile, mix the dry ingredients in a lidded container. Set aside. Drain the onions and place in the flour mixture. Put the lid on and shake until the onions are coated. Using clean hands, remove the onion from the flour and set aside (I use the lid of the container). In another bowl (or wiped out flour container, because seriously who wants more dishes? ), add the olive oil. Add the onions to the olive oil and stir to coat. Lightly spray the inside of the air fryer with olive oil (I used my Misto) and add the onions. Cook for 8 minutes, and then shake the basket to distribute the onions. Cook for another 5 minutes. 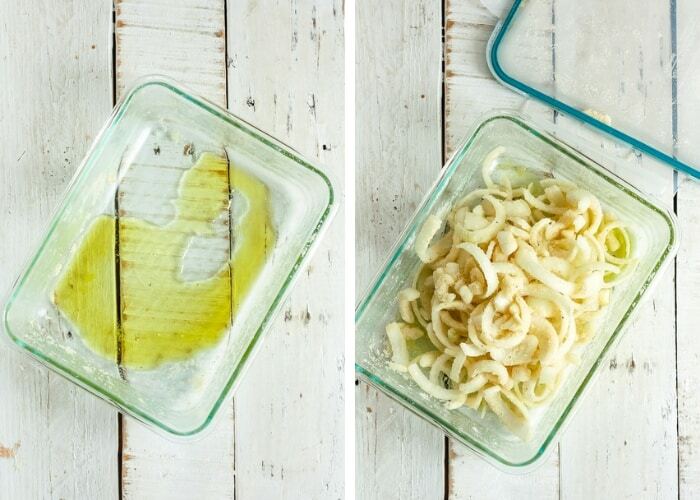 Pro tip: spritz with olive oil on top to keep the onions extra crispy! Continue to cook in 3-minute increments until it has reached your desired level of crispiness (took 20 minutes total for me). I cooked the onions for an additional 8 minutes after the photo on the right was taken. 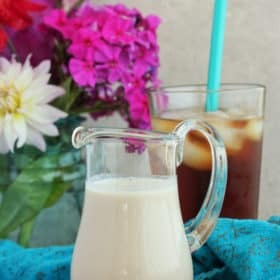 If you consume gluten and dairy, feel free to use all-purpose flour and regular milk. 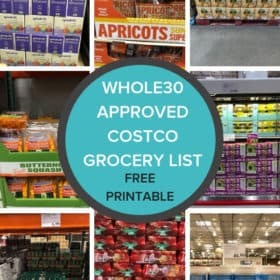 Not Whole30? 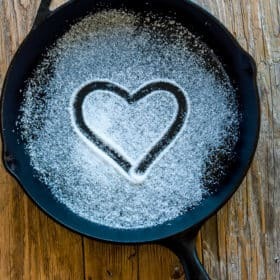 Cornstarch can be subbed in for the potato starch. 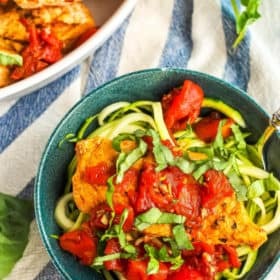 If you follow a keto/paleo lifestyle, use all almond flour instead of adding the potato starch. 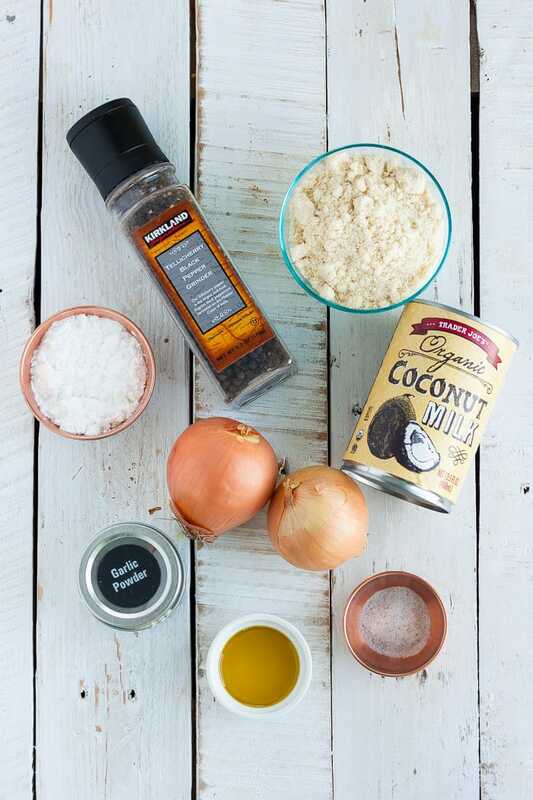 Or, use 2 tbsp of arrowroot powder. 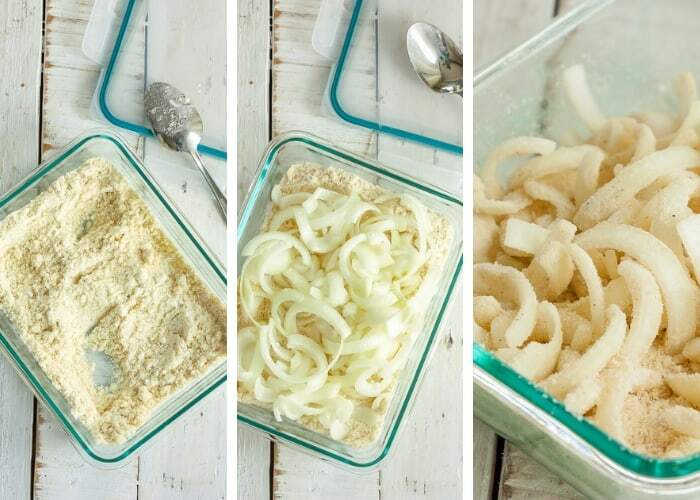 Allow the fried onions to fully cool before storing in an air-tight container. 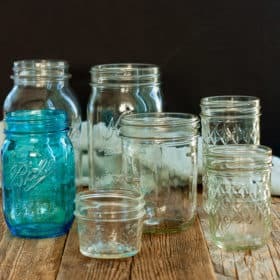 Onions that are still warm will put out heat, causing condensation in the container. Any moisture trapped with the onions will cause the breading to become soggy. 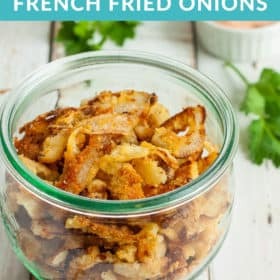 How Far Ahead Can I Make Fried Onion Strings? These onion straws can be stored for two days before using. 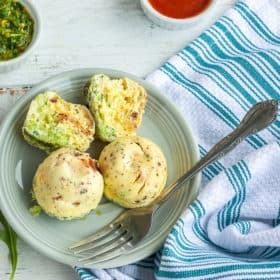 They will lose some of their crunch but can be quickly reheated to crisp up again. 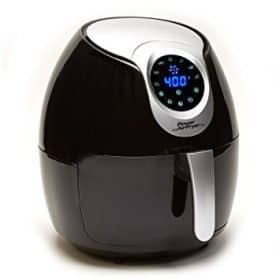 I popped ours back into the air fryer for 1 minute at 400 degrees. 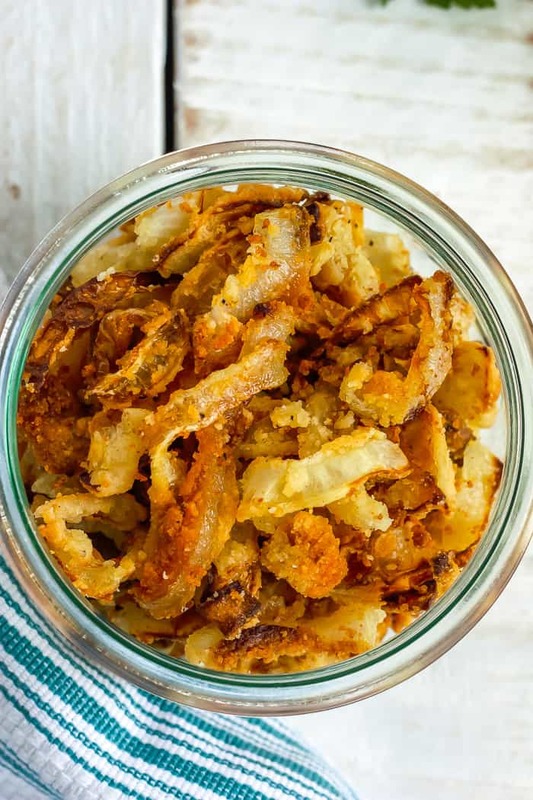 You're in for a treat with these Crispy Fried Onions! 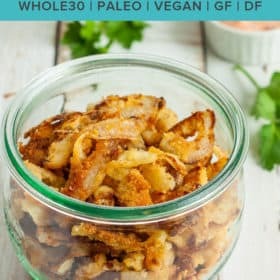 They're so good that it's hard to believe these healthy onion straws are Whole30 compliant, keto-friendly, and vegan. Slice the onion in half and then made "ribbons" about 1/8 inch thick. Separate all the onions and add them to a bowl. Pour milk over the onions and use a spoon to smoosh down the onions so they're mostly covered by the milk. Let sit for 10-15 minutes. Drain the onions, shaking the excess milk off. Place onions in the flour mixture. Put the lid on and shake until the onions are coated. Using clean hands, remove the onion from the flour mixture and set aside (I use the lid of the container). In another bowl (or wiped out flour container), add the olive oil. Add the onions to the olive oil and stir or shake to coat. Lightly spray the inside of the air fryer with olive oil (I used my Misto) and add the onions. Cook for 8 minutes, and then shake the basket to distribute the onions. Cook for another 5 minutes. Pro tip: spritz with olive oil on top to keep the onions extra crispy! Continue to cook in 3-minute increments until it has reached your desired level of crispiness (took 20 minutes total for me). 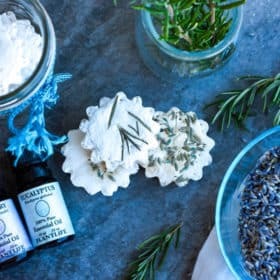 For oven-baking, you'll need to use 1/4 cup olive oil. 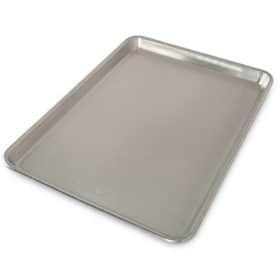 Bake on rimmed baking sheet for 10 minutes. Stir, and bake an additional 10-15 minutes.